Taipei, Taiwan – December 6, 2018 – We proudly announce that 3 AVer products have been recognized as Golden Pin Design Award recipients. The Golden Pin Design Award has honored the AVer VB342 Video Soundbar, the VC322 Huddle Room Conferencing System, and the upcoming M17-13M Mechanical Arm Visualizer for outstanding innovative product design. Established in 1981, the Taiwan Golden Pin Design Award is the most influential design award in the global Taiwan market and is executed by the Taiwan Design Center (TDC). AVer’s VB342 Video Soundbar is an all-in-one, 4K conferencing system focused on providing an unbelievable communication experience for your teams in huddle and small conferencing rooms. Empower team collaboration in your meeting rooms with the VB342’s outstanding audio and crystal clear video. With a unique and compact design you can remove cable clutter and maximize space in your meeting rooms, connecting your remote teams has never been as easy. The VB342 brings a level of collaboration to the conference room that engages teams with their meetings and makes sure they have the competitive advantage they need for success. Creating exceptional collaboration in huddle and medium sized rooms, the AVer VC322 brings a 4K PTZ camera and a compact, low footprint design to your meetings. Build a huddle room that lets your teams connect and drive communication by tearing down geographic barriers with the VC322’s easy to install, wide ranging camera and compact audio speaker. Engage instantly with your international teams from any room with an unshackled video conferencing system that puts digital collaboration at the forefront of your meeting. Teachers can create a classroom full of discovery with the upcoming standalone AVerVision M17-13M Mechanical Arm Visualizer. 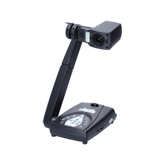 Easily integrate the M17-13M with existing classroom equipment, like a projector, to present and explore every detail of an experiment or material with a powerful optical zoom and crisp, clear imaging that allow students to truly envision what learning is really about. Teachers can use the M17-13M’s lag-free display to record or stream classroom activities to make sure that every in-class experiment, head-to-head debate, or object examination are captured perfectly for future use both in class and at home. Bring never before seen engagement into the classroom with the AVerVision M17-13M. Coming spring 2019.